Ill be taking possession of a TAC A1 in 6.5 soon and was wondering if anyone has chrono data on the Berger match grade ammo 130 and 140 grain hybrids? Scratched the itch with an MDT ESS Chassis. Gotta say that they are really well-made chassis and the fit and finish is truly excellent. I'll post up some photos when I get back home but found the whole experience of a new chassis fantastic. I'll be selling off the chassis though as even with it being a target based rig, it was too big to carry around the farm even on short strolls with everything still on it. Can see how amazing they would be for matches or dedicated gong bashing. I had the LSS initially, wish I'd done the ESS to begin with. I just like it better for some reason. I could see that with the additional weight of the rail. It was a standard stock. Wanted an ESS for a long time then I had to work offshore for 10 months after it arrived so I only got to see pictures...that was a touch annoying! ANyway, I have ordered a "Ken Henderson" or HiTec stock to replace the chassis made here in NZ. They're carbon fibre and have an integral bedding block so I ordered flush cups on the left side so I can use my biathlon sling to carry it about the farm easier. No pictures of that yet but when it's made I'll post up. Here are some shots from the Gong session. We only made it out to 335 yds but most groups were tight with the Norma Match 130. The Gongs were up in the rock formation you can see in the distance. I've included a close up of the Sterk shroud from @cannoncrossfire in case you were thinking of ordering one. They are beautifully crafted and his service is fantastic. That looks slick as f...antastic, perfect. You now do have two stocks, the ESS and a fibre composite stock, which you are changing regularly? I have ordered the Hi-Tec carbon stock so it will be a few weeks before it's laid up and on the way. I'll sell off the ESS but it's so comfortable to shoot so I'll miss it but I will certainly not be in need of the recoil management aspect with a suppressed 6.5 Creedmoor! I have a wee project underway as it will need some bottom metal inletting and a load developed so I'll be sending it away whilst I'm out of the country until the end of the year. The suppressor is super quiet and I love the caliber. 130 gr hornady ELDM, RL16 shooting 2616fps. Took it out the 1000 and back and vx5 was great but not going to be serious dialing as this will be a suppressed hunting rifle but good to know it’s capable! How do you like the Thunderbeast? Been pondering a can for a while, be going on a 7 Mag, for hunting ..does it soften the report, or do you still get a pretty good crack when you fire it? With a little free time tonight, I made a brief attempt to remove my factory T3 barrel. Used a Mechforce vise, and a Brownells universal action wrench. Had a 3 foot cheater section of steel galvanized pipe ready to help too. I think the Brownells wrench engages the receiver flat nicely enough, it should definitely work. I have a PVA rear entry wrench as well, but I’m afraid that will get ruined removing a factory barrel? Anyway, I got everything tightened down and ready to go and I can’t stop the barrel from slipping/spinning in the leather straps of the barrel vise. As I ran out of time I took it all apart and will try again another time. What should I put on the barrel or leather straps to stop it spinning? I’ve read powdered sugar, sand, oil, rosin. Man, I’m still struggling with this. I let kroil soak in the threads. I am using rosin powder. I have tried using the leather straps, copy paper, and just bare vise. Tried just rosin powder, tried oil and rosin, tried rosin and a little spray adhesive. I heated the action joint too with heat gun. No matter which of these combinations I tried, the damn barrel still spins in the vise. Shredded the leather straps, and the paper pieces too. I feel like I could break it loose with the cheater bar if it would just stop spinning. Now I need to get a toothbrush and get all the gunk built up off of the barrel and the vise pieces. Any other tips or ideas for getting the barrel to stay stuck in the vise and not spin? No matter which of these combinations I tried, the damn barrel still spins in the vise. I feel like I could break it loose with the cheater bar if it would just stop spinning. What are you doing? Barrel swap? Yeah. Trying to remove factory barrel. Here is my 2 Tikkas. CTR and Tac A1. Both 308. With everything tightened down, I’m trying to turn the wrench by hand, with the cheater bar, and the barrel spins. Should I be whacking the wrench handle with a hammer instead of just pushing? Sorry for the dumb questions, just getting a little stumped. I like it and as soon as I can find a ultra 7 direct thread I’m gonna order one. I gave up trying to retain the factory finish on mine. I clamped my aluminum vise Jaws together and drilled them on the split line with a 3/4" drill bit. It fit the barrel snug and it came off pretty easily. There are 2 marks on the barrel from the Jaws, but I figure if I ever decide to use it or sell it it's just gonna have to be cerakoted or reblued. Can’t you just send in your action to Tikka and have them do the swap for you? I got it! Brown sugar and a few solid whacks with a 4 lb hammer on my cheater pipe and it spun right loose. My gunsmith told me he ends up having to make a relief cut in the barrel in front of the action to get most factory Tikka barrels off. Question for those KRG owners...why do you have to permanently remove the spring clip (see picture) when installing your action to a the KRG chassis? I mean, it's not permanently removed, it's held on by a screw... But yes it needs to be removed. It is what holds tension on the factory magazines that release from the front, AICS mags release from the back. Got it..so just remove clip, reinstall screw. What about the barrel nut housing screws? Is there a place to reinstall those on the KRG xray? Yeah, about five years ago, went from the occasional dial tone to full time ringing. Drove me batty for the first month or two, little nervous about making it worse since then. I feel like this is an old wive's tale by now, this needing a relief cut business. If a consumer can remove a Tikka barrel with some effort I would expect a gunsmith to have no issues. Sadly it seems many gunsmiths aren't so smart, or only know how to work on Remingtons. I feel like this is an old wive's tale by now, this needing a relief cut business. If a consumer can remove a Tikka barrel with some effort I would expect a gunsmith to have no issues. Sadly it seems many gunsmiths aren't so smart, or only know bow to work on Remingtons. He's a reputable smith and very widely known. The rifles that he has built for me are absolute hammers. He did in fact cut the barrel off of the Tikka he recently did for me. I would much rather have him make a relief cut in the old barrel than apply more force than he's comfortable with and twist my action. That's cool, different strokes for different folks. My personal feeling is that a smith that has to resort to cutting a relief simply doesn't have the right tools/tooling for a Tikka. Is anyone running the KRG xray chassis? I picked up an X-Ray on here used. Was going to get the Bravo, but this was a better deal. I have added a spigot to it since these pictures were taken. 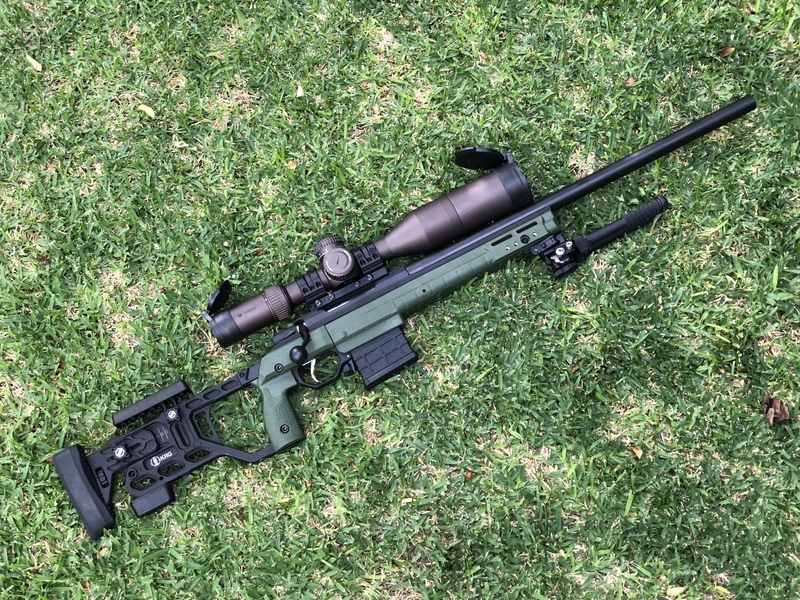 What chassis systems are direct drop in for the Tikka T3X Tac A1? I’m looking at swapping out to a fixed stock over the folding oem T3X. German Gun Stock makes drop in stocks for the Tikka. They have 3 models, all with aluminum inserts that do not need bedded, but you will need bottom metal for them. Your TAC A1 has it built in. I have a CTR in their Predator and a Varmint in the Ranger. My son has a Raptor that will be here today. I have the factory CTR bottom metal on my Predator and Mountain Tactical CTR inlet for AICS mags on my Varmint. I used low rings with a Burris XTRII and had to use a stock pack. I did have a 20 moa rail on it though. Nice! What Tikka barreled action did you use in the Xray? I’m still a little confused on how the Tac A1 action will work in the xray, because it looks different than the normal T3X? Other than the front two barrel nut bolts that I posted a picture of above, is the Tac A1 a direct drop in for the Xray chasis? What about how the scope rail lines up on top? I used a T3 action with a 26" light varmint Bartlein. It is a match rifle I built for PRS matches. It started as a 270 T3 Lite. I used the action and the trigger. All Tikka T3 and T3x actions are the same footprint. The TAC A1 is the same as a CTR. I finally received my X-ray, really liking it. But Whiskey is the love connection, that is just amazing rig. Ase Utra SL5i supp, Coletac cover+2ammo holder. Spuhr mount, Kahles K624i scope, Vortex defender caps, Mkmachining level and lever, Sterk swept bolthandle , Atlasworx boltshroud, MDT AICS magazines, these are great by the way, Atlas prs bipod, Riflesticks spiked feets, these are killers. What color is that Cerakote? Is it the AI Brown or Federal Standard Field Drab? Nice rig. It will fit just fine, but you will have to remove the current chassis components, including the barrel ring that holds the forend. Our chassis come with the proper action screws (x2) and that is all you will need, to attach the receiver. The existing rail will work but it is really tall, you might want to look at getting one that is more of a standard height. Very nice! West VA? Do you shoot @ Peacemaker? Nah but I do shoot at Harry Jones. I’m in Morgantown. It is mentioned much earlier in this thread. Made in Germany. Three position safety. Don't remember name but it was really expensive. Over $200. What I remembered. Talking about it on page 72. $196.70+20% vat =236. 04+ shipping. Yea I saw that but that’s not what I’m talking about. I’ll keep looking. I seem to remember someone made it custom and said they might sell them. Ive got a few people interested but they have to be 3d printed (can't be machined), so theres a fair bit of hand finishing. Got a heap of other products to make at the moment but might do some more metal 3d printing and see what people think. Roedale has one too with the three position safety. Although I think it's the same one someone else posted above. Why can’t it be machined? I run a machine shop, I might be able to figure that one out... PM me if you’re interested, maybe I can help. I work at a machine shop too and it's maybe possible with 5 axis and a tiny ballnose haha. The issue is the round front changing to a square back - but the transition is on an angle due to the shape of the back of the tikka action. It might look simple but to make it is another story. Big thanks to this forum for the info & advice I got to help me spec up this build. Cerakote color on the action&barrel is tan coyote. This Tikka was TAC A1 once, but i stripped that factory stock off, and now it is more like a CTR. It has a CTR picatinny rail, and singe stage trigger. That 2-stage is on the 308win X-ray CTR. How heavy of bullets can the 7.5" twist barrel handle?